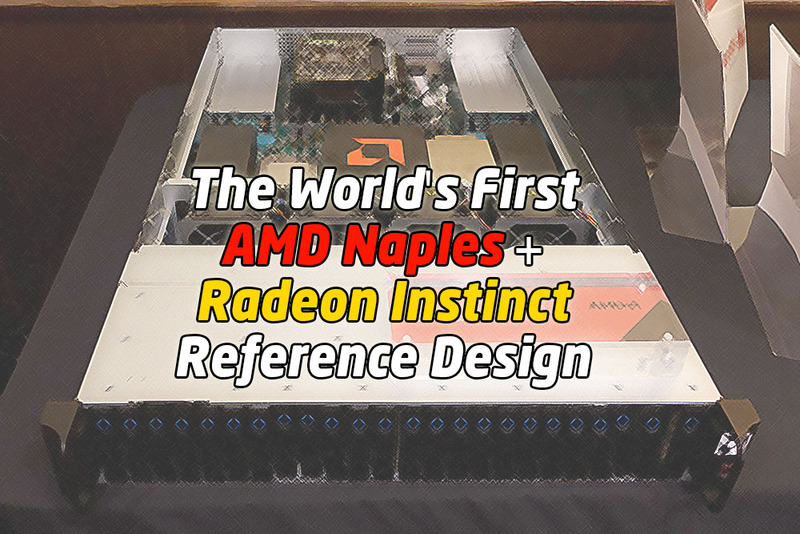 The First AMD Naples + Radeon Instinct Reference Design Revealed! We had earlier revealed the upcoming AMD Ryzen desktop processor, and the AMD Radeon Instinct compute accelerators. But that was not all they revealed at the AMD Tech Summit held in Sonoma last month. AMD also showcased the world’s first AMD Naples and Radeon Instinct reference design! This is a compact 2U (19″) server with two AMD Naples processors, and two Radeon Instinct accelerators. Check it out! Formerly known as Summit Ridge, the AMD Ryzen is an octa-core desktop processor that promises to match, if not beat, the Intel Core i7-6900K in both performance and power consumption. Like Ryzen, the AMD Naples processor is based on the AMD Zen microarchitecture. But instead of having just 8 cores, AMD Naples is a server-class processor that boasts 32 cores! Like Intel Xeon processors, the AMD Naples processor can process two threads per core. So the 32-core AMD Naples processor can handle up to 64 threads simultaneously. It will also reportedly feature a massive 512 MB L3 cache. Compared that to the top-of-the-line Intel Xeon E7-8890 v4 processor that only has 24 cores and handles up to 48 threads simultaneously, and only has a 60 MB L3 cache. If the AMD Naples processor delivers the same performance and power consumption we saw with AMD Ryzen, then it should deliver at least 33% better compute performance than the Intel Xeon E7-8890 v4 processor, and blow it out of the water in memory performance. Now that will be a killer server CPU. If the potentially superior AMD Naples compute performance does not impress you, the reference design also showcased the new AMD Radeon Instinct accelerators. Their 2U server reference design featured what appears to be two AMD Radeon Instinct MI8 SFF accelerators. The Radeon Instinct MI8 is a passively-cooled accelerator that requires only 175 W of power. Each MI8 accelerator delivers 8.2 TFLOPS of FP16 compute performance with 512 GB/s of memory bandwidth. So two of them will offer over 16 TFLOPs of FP16 compute performance in this 2U server. Next : Watch AMD Vega Run DOOM On Vulkan!